Appearance: Rats look like bipedal, clothed rats in our world. Searats often have ears pierced several times over with gold rings, and sometimes tattoos. Searats prefer the cutlass for their weapon. While rats look a lot like mice, they tend to be larger, uglier, stockier, and rougher in appearance. Typical Personality: Rats are one of the less intelligent vermin species, but they aren't as stupid as stoats - not for the most part, at least. Don't be too hasty to label them stupid as a whole, though- they range from quite intelligent to quite stupid, though most are on the latter end of the spectrum. However, Cluny the Scourge was a rat, and he was fairly intelligent- one of the few vermin to conquer Redwall. Many of the rats in the other books are no higher in rank than common soldiers, and usually blundering idiots. Searats, however, seem to be a breed apart- they are usually more intelligent than their landbound cousins. Habits: Rats tend to either have a pirate's slang (if they're searats) or an indescribable accent that labels them as none too bright and not too savory either. However, there are some rats who speak with a cultured accent or in a common woodland style. 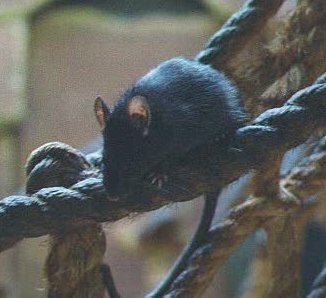 Appearance: Rats are usually colored some shade between black to tawny brown, but rarely are more than one color. The underside is paler than the dorsal side. The rats are usually 18-22 cm long, with a tail that is 18.5-24 cm long. Diet: Rats are omnivorous and eat just about anything - seeds, nuts, vegetables, fruits, insects, invertebrates, and other materials such as soap, paper, hides, and beeswax. Habitat: Black rats live in high places off the ground, making loose, round nests of shredded vegetation, cloth, or other suitable material. They live in trees or on roofs. They live in cities, villages, cultivated fields, and many undisturbed habitats. Typical Personality: Rats are territorial yet sociable. They form clans of up to sixty rats, usually containing a dominant male and sometimes a male hierarchy. The females have their own, separate hierarchy as well. Females tend to be more aggressive than the males. Kits are exempt from the social squabbling and are fed by any rat, including the dominant ones. Habits: Rats are nocturnal, being mostly active at dusk and night. They are excellent climbers and can almost literally go straight up a wall. Life Cycle: Female rats have between 3 and 7 litters a year, any time of the year, and have six to twenty-two kits per litter. The kits are weaned after three to four weeks of life.